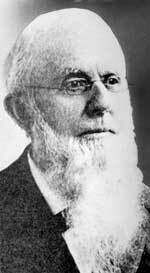 Joseph A. Campbell (15 May 1817 – 27 March 1900) started the company that introduced condensed tomato soup in 1897. Today, the Campbell Soup Company (2007) is 50 to 60% owned by the Dorrance family. In the UK and in North America, the same varieties of condensed soups are sold. In China, the varieties include Watercress, Duck-Gizzard, Hot and Sour Soup, Chicken with Winter Melon Soup and Cream of Pumpkin. In Argentina, Chicken Noodle is not popular, but Split Pea with Ham is. 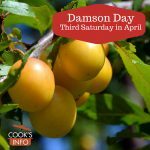 As of 1905, the company sold 21 varieties of soup: Asparagus, bean, beef, bouillon, celery, chicken, chicken gumbo, clam boullion, clam chowder, consommé, julienne, mock turtle, mullitatawny, mutton, oxtail, pea, pepper pot, printanier (beef broth with vegetables), tomato, vegetable, vermicelli. In 1918, clam bouillon was replaced by vegetable beef. Mulligatawny was discontinued in the 1930s. Joseph Campbell was born in Cumberland County, New Jersey, on 15 May 1817 to James Campbell (a blacksmith, born 25 Feb 1786, died 1856) and Hannah Ogden Campbell. His parents had married on 28 March 1810. On 26 January 1839, Joseph married Abigail Powell Moore (born c. 1819), but she died on the 4th May 1841. On 7th May 1852, he remarried to a cousin named Adeline Ogden (born c. 1829.) They had one son, Charles Frederic Campbell, born April 1856, who died in infancy. Adeline herself died on 17 May 1856. 1817 — Joseph Campbell is born on 15th May 1817 in Bridgeton, New Jersey. 1869 — Campbell opened a canning factory at 41 North 2nd Street in Camden, New Jersey, with Abraham A. Anderson as a partner. They called it the Anderson & Campbell Preserve Company. Previously, Campbell had been a fruit merchant; Anderson was an icebox maker. 1891 — The company’s bestseller was “Beefsteak Ketchup.” It wasn’t what we’d think of as a tomato ketchup. Theirs was more of a sauce, closer to the original meaning of ketchup like Worcestshire sauce. It was made from anchovy, lobster, mushroom, soy and walnuts, flavoured with cinnamon, cloves, mace, mustard and vinegar. 1892 — Campbell renamed the company to the “Joseph A. Campbell Preserve Company.” The company produced canned tomatoes, condiments, jellies, mincemeat and vegetables. 1894 — Campbell retired. Arthur Dorrance became President. 1897 — A chemist working for the company, Arthur’s nephew Dr John T. Dorrance (11 November 1873 – 21 September 1930), who was only 24 at the time, invented condensed soup. Condensing soup by taking the water out of it meant that the packaging and shipping costs were lowered. John had chemistry degrees from MIT and from Gottingen, Germany. He was paid $7.50 a week and had to buy his own laboratory equipment. The first condensed soup introduced was tomato. 1898 — The company introduced its red and white colours, when a company executive (Herberton Williams) saw how good the colours looked on Cornell University’s new football uniforms. 1900 — Joseph Campbell died on 27 March 1900 in Riverton, New Jersey. He was buried in Woodlands Cemetery, Philadelphia, in plot Section C, Lot 515. His wife Sarah and his two daughters, Elizabeth and Antoinette, are buried with him. 1900 — In the same year, the condensed tomato soup won a gold medal in the Paris Exhibition. This is the gold medal still displayed on the tins. At this time, a tin of Campbell’s condensed soup sold for ten cents. The uncondensed soup his competitors still made was selling for over 30 cents. 1904 — The Campbell’s Kids are introduced, designed by Grace Wiederseim Drayton, an illustrator and writer. 1912 — Joseph’s wife Sarah dies. 1914 — John T. Dorrance becomes President. 1915 — Campbells buys the Franco-American Food Company. 1916 — First publication of a cookbook, “Helps for the Hostess,” showing how to use condensed soups in recipes. 1930 — John T. dies. He is succeeded by his brother, Arthur. 1930s — The “Mm! M’m! Good!” jingle is introduced on the radio. 1934 — Cream of Mushroom and Chicken Noodle condensed soups are introduced. 1960 — Campbell’s purchases the Pepperidge Farm Company. 1961 — Campbell’s enters the Australia market, opening a manufacturing plant at Shepparton, Victoria in 1964. 1980 — Campbell’s moves soup production out of Camden. 1990 — Campbell’s ceases all manufacturing operations in Camden, but keeps its administrative headquarters there. 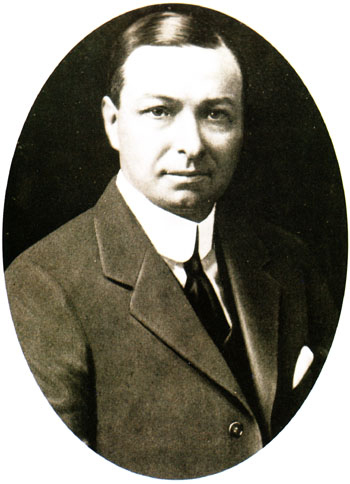 2012 — John T. Dorrance is posthumously inducted into the New Jersey Hall of Fame. In England, Campbell’s had a plant in King’s Lynn, Norfolk from 1959 to 2011. (Click for larger)]Campbell’s opened a UK factory in King’s Lynn, England in 1959, and one in Shepparton, Victoria State, Australia in 1962. In the fall of 2006, Campbell’s sold its UK division to Premier Foods, including the recipes for its soups, but did not sell to them the right to use its label. Consequently, as of March 2008, all the soup was rebranded as “Batchelors Condensed Soup”, with text on it saying “Formerly Campbell’s. 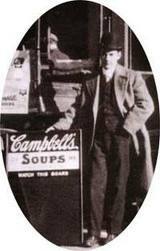 Same great taste.” There were 22 flavours of Campbell’s soup being made in England at the time of the sale. “Campbell Soup’s Green Bean Casserole” was invented by Dorcas Reilly (born 1926) in 1955. 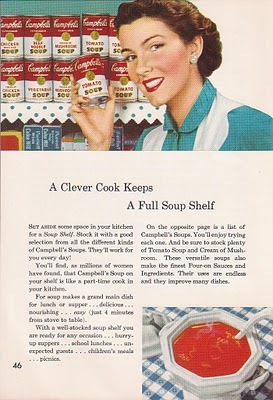 She was in charge of the Campbell’s test kitchen. Her original 8 X 11 recipe card was donated in 2002 to America’s National Inventor’s Hall of Fame. It uses Cream of Mushroom soup. Campbell’s estimates that 40% of its Cream of Mushroom soup sold is used for this recipe alone. Andy Warhol painted his Campbell’s Soup tins from 1962 to 1968. Daily Mail. Re-introducing Campbell’s: Back in stock, the soup loved by cooks and Warhol. London: Daily Mail. 1 August 2011. BBC. UK shops to lose famous soup can. Retrieved October 2007 from http://news.bbc.co.uk/2/hi/business/7022598.stm . Levinsky, David. Cinnaminson’s John Dorrance named to NJ Hall of Fame. Pennsylvania: Burlington County Times. 12 February 2012. Mcqueeney, Kerry. This one’s for you, dad: Grieving daughter blows up building where father died in factory accident. London: Daily Mail. 16 January 2012. Shea, Martha Esposito and Mike Mathis. Campbell Soup Company. Charleston, South Carolina: Arcadia Publishing. 2002.